Miltenyi Biotec solutions for pluripotent stem cell culture, passaging, and cryopreservation ensure gentle handling and recovery with high viability. In this application protocol, we introduce the use of these solutions, as well as a multicolor flow cytometry protocol that allows for the simultaneous quantification of intracellular and surface markers for easy phenotyping of human pluripotent stem cell cultures. PBE buffer consisting of PBS, pH 7.2, 0.5% BSA, and 2 mM EDTA. Prepare PBE buffer by diluting MACS® BSA Stock Solution (#130-091-376) 1:20 with autoMACS® Rinsing Solution (#130-091-222). Keep the buffer cold (2−8°C). Media should be changed daily for pluripotent stem cell cultures. Maintain human embryonic stem cells (ES) or induced pluripotent stem cells (iPS) on a standard cell attachment matrix (e.g., Matrigel® or Laminin-521) in StemMACS™ iPS-Brew XF medium. The medium is designed to enable culture under feeder-free conditions and allows rapid culture initiation after cryopreservation. Follow the protocol of the medium data sheet. Use the StemMACS™ Passaging Solution XF for gentle detachment of pluripotent stem cell colonies and dissociation into cell clusters. The solution is designed to minimize manipulation of the culture, eliminating lengthy inactivation, dilution, or centrifugation steps. 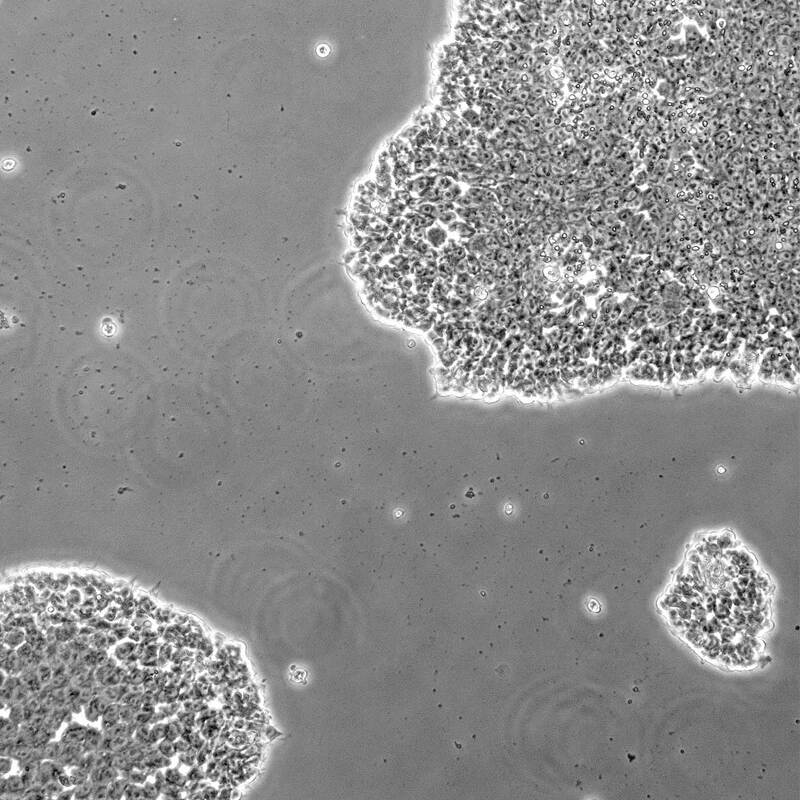 Thus, transfer into new cell culture conditions is reproducible, standardized, and fast, ensuring optimal viability and attachment. Follow the protocol of the solution data sheet. Detachment of pluripotent stem cells using the StemMACS Passaging Solution XF. After a few minutes exposure to the passaging solution, the cells begin to round up at the edges, at which point the solution can be removed. After a few minutes exposure to the passaging solution, the cells begin to round up at the edges, at which point the solution can be removed. The panel for analysis of pluripotent stem cells includes antibodies for both surface markers and intracellular markers. Surface markers are stained first. Subsequently, cells are fixed and permeabilized for intracellular staining. To set up the instrument and compensate for spectral overlap, single stainings for each antibody and an unstained cell sample are required. The unstained sample does not contain any antibody, but is otherwise treated, e.g., fixed and permeabilized, in the same way as the stained samples. The pipetting scheme in the tables below provides an overview. 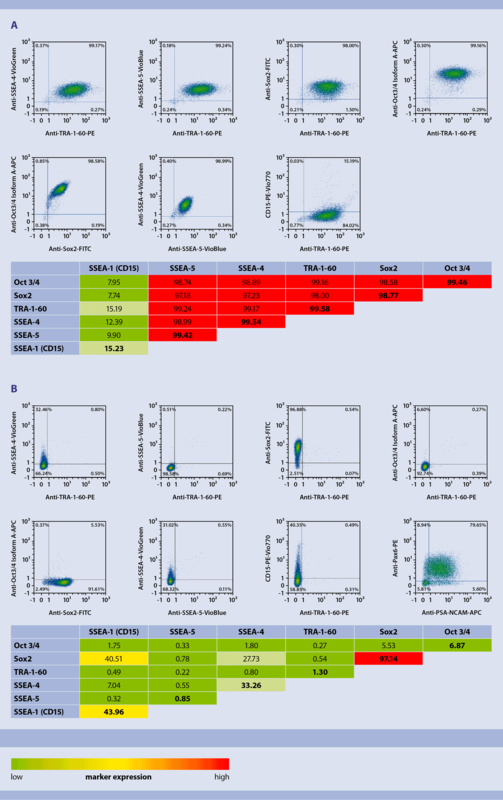 As SSEA-1 is not expressed in pluripotent cells, the MACS® Comp Bead Kit, anti-mouse Igκ is used for compensation of PE-Vio® 770 instead of a cell sample. ▲ Note: Fluorescence-minus-one (FMO) controls might help you to set the gates more accurately. FMO controls contain all antibodies except for one. Pipetting scheme for surface and intracellular staining. Cell surface staining refers to steps 3–8 of the protocol below. Intracellular staining refers to steps 14–19. Determine cell number. Use 1×10⁶ iPS cells per sample. Centrifuge cell suspension at 300×g for 5 minutes. Aspirate supernatant completely. Resuspend sample 1 in 77.8 μL of PBE buffer. This will be the cell sample stained with the complete panel. Resuspend samples 2–7 in 100 μL of PBE buffer. This will be the unstained and single-stained samples. Add 10 μL of each of the following antibodies against surface markers to sample 1: i) Anti-TRA-1-60-PE, ii) Anti-SSEA-4-VioGreen™, and iii) Anti-SSEA-5-VioBlue®. Add 2.2 µL of CD15-PE-Vio770. Add 10 μL of one of the antibodies detecting a surface marker to samples 3–5. Do not add antibody to samples 2, 6, and 7 at this point. Mix well and incubate for 10 minutes in the dark in the refrigerator (2−8 °C). Wash cells by adding 1 mL of PBE buffer per sample and centrifuge at 300×g for 5 minutes. Aspirate supernatant completely. Resuspend all samples in 100 μL of PBE buffer. Add 100 μL of Inside Fix per sample. Mix well and incubate for 20 minutes in the dark at room temperature. Wash cells by adding 1 mL of PBE buffer and centrifuge at 300×g for 5 minutes. Aspirate supernatant completely. Resuspend sample 1 in 97.8 μL of Inside Perm. Resuspend samples 2–6 in 100 μL of Inside Perm. Resuspend sample 7 in 107.8 μL of Inside Perm. Add 10 μL Anti-Sox2-FITC to sample 1 and 6. Add 2.2 µL of Anti-Oct3/4 Isoform A-APC to samples 1 and 7. Mix well and incubate for 15 minutes in the dark at room temperature. Wash cells by adding 1 mL of Inside Perm and centrifuge at 300×g for 5 minutes. Aspirate supernatant completely. Resuspend cell pellet in a suitable amount of PBE buffer for analysis by flow cytometry. A volume of 1 mL of PBE buffer per sample is recommended. ▲ Note: Fixed and permeabilized cells are smaller than viable cells. Thus, FSC/SSC settings of the flow cytometer might have to be adjusted. Set up the scatter and voltages for all channels with the unstained cell sample (sample 2) (A in figure below). Specify the trigger. Use single-color stainings (samples 3–7) to define the compensation (B in figure below). To set up the PE-Vio 770 channel, temporarily lower the trigger to detect all the Comp Beads and define the compensation (C in figure below). Afterwards change the trigger settings back to the value specified in step 1. Setting up the flow cytometer for compensation of spectral overlap. (A) Adjustment of scatter and voltage using an unstained sample. PE vs. FITC is shown as an example. (B) Compensation using a PE-stained cell sample; PE vs. FITC is shown as an example. (C) Compensation of the PE-Vio 770 channel using MACS Comp Bead Kit, anti-mouse Igκ according to the kit protocol. PE-Vio 770 vs. PE is shown as an example. (A) Adjustment of scatter and voltage using an unstained sample. PE vs. FITC is shown as an example. (B) Compensation using a PE-stained cell sample; PE vs. FITC is shown as an example. (C) Compensation of the PE-Vio 770 channel using MACS Comp Bead Kit, anti-mouse Igκ according to the kit protocol. PE-Vio 770 vs. PE is shown as an example. Isotype controls are used to check for non-specific binding of the various fluorochrome-conjugated antibodies to cells. Cells are incubated with the isotype control antibodies following the instructions above for preparing sample 1 and analyzed accordingly. The figure below shows a representative example of isotype control staining. Isotype control staining. 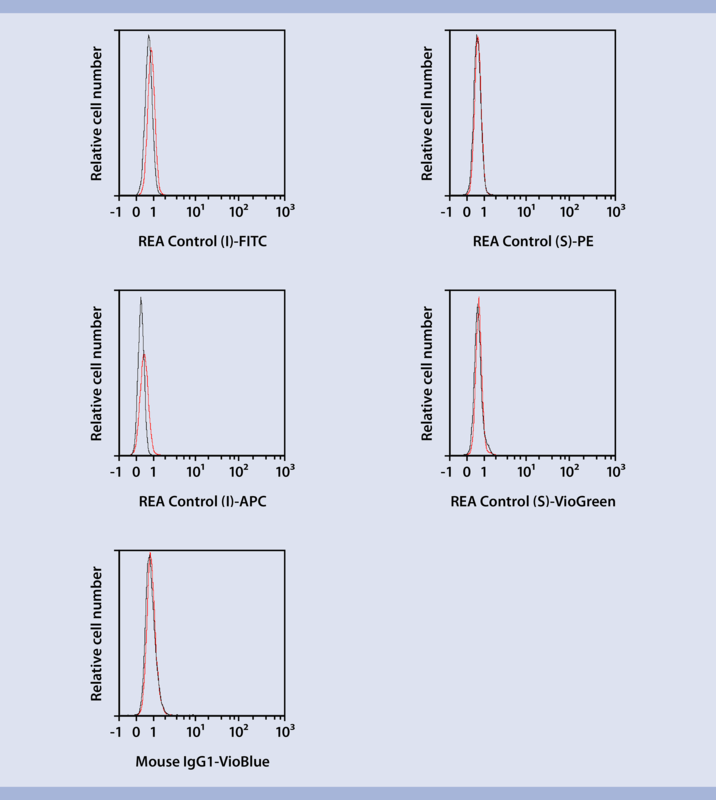 Cells were incubated with the various isotype control antibodies (red line) or left unstained (black line) and analyzed by flow cytometry on the MACSQuant® Analyzer 10. Cells were incubated with the various isotype control antibodies (red line) or left unstained (black line) and analyzed by flow cytometry on the MACSQuant Analyzer 10. This antibody panel enables the simultaneous detection of both surface and intracellular markers for monitoring pluripotency. The figure below shows a representative result for the analysis of human induced pluripotent stem cells (iPS). The pluripotency markers SSEA-4, SSEA-5, TRA-1-60, Sox-2, and Oct 3/4 were expressed at high levels, whereas expression of the differentiation marker SSEA-1 (CD15) was low. In contrast, cells differentiated towards the neural lineage expressed the pluripotency markers at low levels, or even shut off the expression of pluripotency markers, and up-regulated the differentiation marker SSEA-1 (CD15). Sox2 was expressed at high levels, as would be expected from neural precursors. As a differentiation control, a second sample was stained with antibodies against PSA-NCAM and Pax6, which are markers for neuronal and neural progenitors, respectively. The large majority of cells (80%) co-expressed both markers. 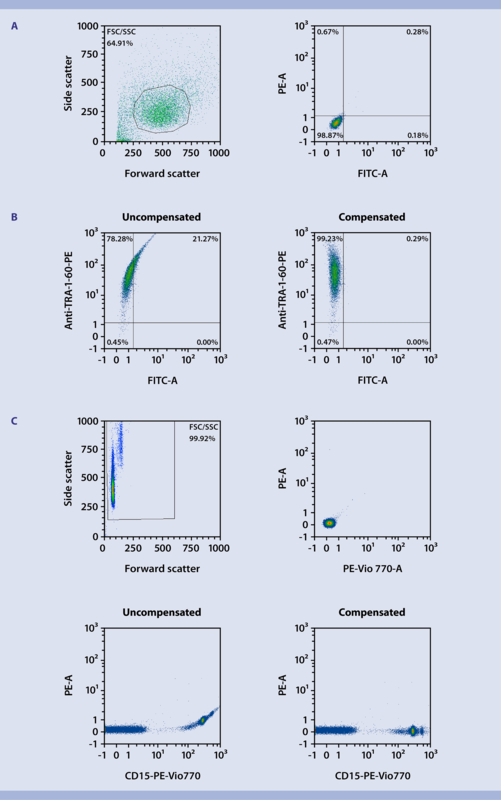 Multicolor flow cytometry analysis of undifferentiated (A) and differentiated (B) human iPSCs. Cells were stained with the antibodies as indicated and analyzed by flow cytometry on the MACSQuant Analyzer 10. Unstained cells were used as a control for gating. Numbers in the heatmaps specify percentages of single-positive (bold numbers) and double-positive cells. Cells were stained with the antibodies as indicated and analyzed by flow cytometry on the MACSQuant Analyzer 10. Unstained cells were used as a control for gating. Numbers in the heatmaps specify percentages of single-positive and double-positive (bold) cells. PSC cultures were also monitored visually by light microscopy. The images show the typical morphology of PSC colonies (A in figure below) or cells differentiated into neural precursors (B in figure below). Cultures of undifferentiated human iPSCs (A) and iPSCs differentiated towards the neural lineage (B). Shown are light microscopy images of the same cultures that were used for flow cytometry above. Cultures of undifferentiated human induced pluripotent stem cells (A) and induced pluripotent stem cells differentiated towards the neural lineage (B). Shown are light microscopy images of the same cultures that were used for flow cytometry result displayed above. Use the StemMACS™ Cryo-Brew for cryopreservation of pluripotent stem cells to ensure high viability and rapid recovery after thawing. To freeze as single cells, use Trypsin/EDTA for cell detachment. To freeze as cell clusters, use StemMACS™ Passaging Solution XF for detachment. Follow the protocol of the StemMACS Cryo-Brew data sheet.